It was Friday and Miss Issa and I decided to take a stroll in Coconut Grove. 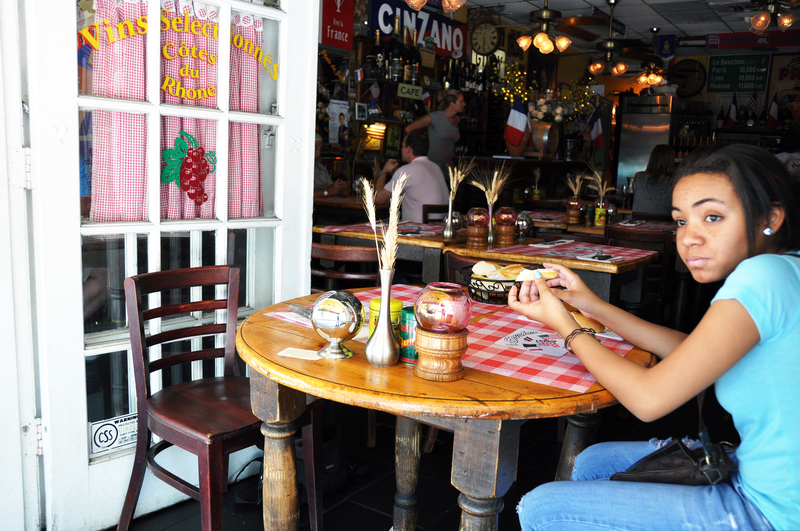 Hungry, we ended up at Le Bouchon Du Grove, a distinct French Bistro in Miami. This is a sidewalk café, full of character and personality, close your eyes to the surroundings outside and it is easy to believe that you are in a little corner of Lyons. The decoration is a multi-colored tribute to France, this is a relaxed little restaurant that has been around since 1994 and serves breakfast, lunch and dinner. Neither of us had breakfast and it was after noon. So what to order? As usual, Miss Issa chooses an atypical lunch: scrambled eggs with bacon and fried potatoes, breakfast for lunch! She truly enjoyed this dish and almost licked the plate when she was done. This was a real treat at this time of the day and made Issa’s belly very happy. I was craving snails and ordered Snails in Garlic Sauce. The French name is Escargots in Persillade which is a sauce made of a mixture of parsley (French: persil) chopped together with seasonings including garlic, herbs, oil, and vinegar. Escargots are dear to my heart as I love the chewy yet soft texture, it is divine to me. 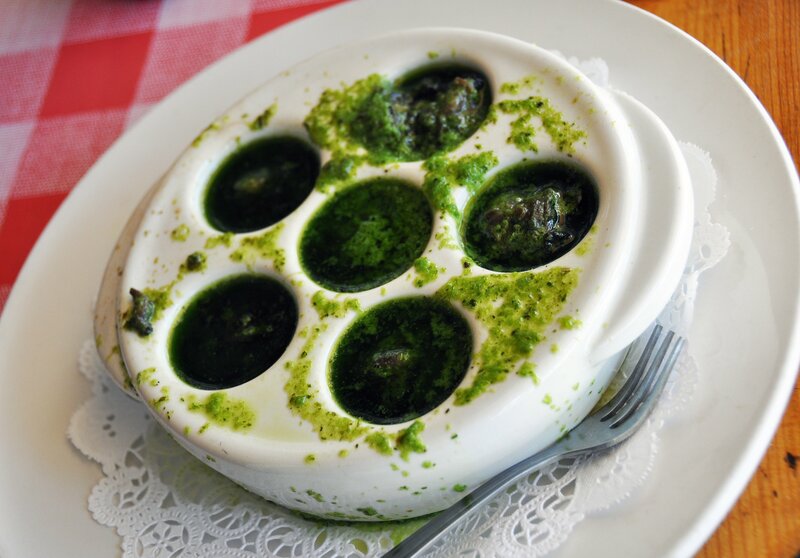 The escargots were swimming in a pool of garlic and parsley sauce, parsley overflowing all over the dish. I almost licked the dish like Issa but instead I did the what I never do: I broke the bread and dunked it in the delicious sauce, no way I was going to let the sauce waste. I always stay away from bread, but not this time. Moules Marinières– Pommes Frites, such a romantic name for a pot brimming of steamed mussels. I am not kidding when I say a pot of mussels, we are talking a massive red pot crammed full with mussels resting in a flavorful sauce so good it could also be eaten as a soup. We ate the mussels, one by one, filled with glee. 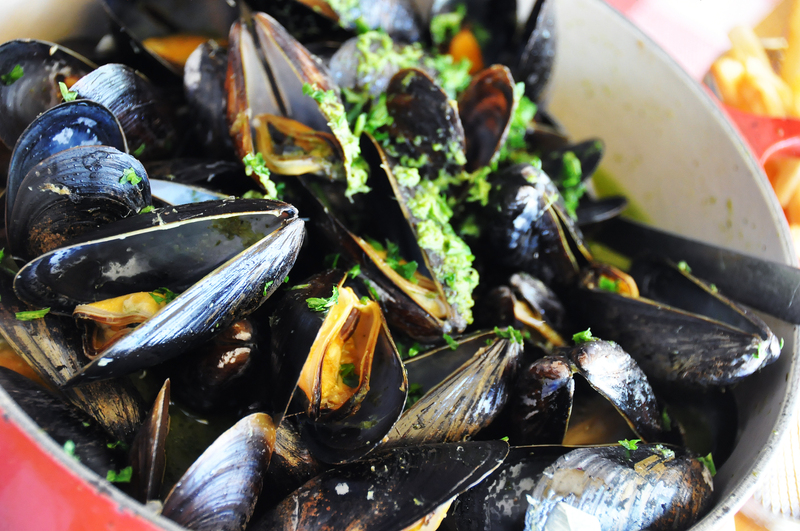 Sweet, marine morsels from the sea with a touch of parsley. We drizzled the fries with salt and pepper and this only enhanced the ocean-taste of the mussels. One fry, one mussel, one fry, one mussel. Heaven. 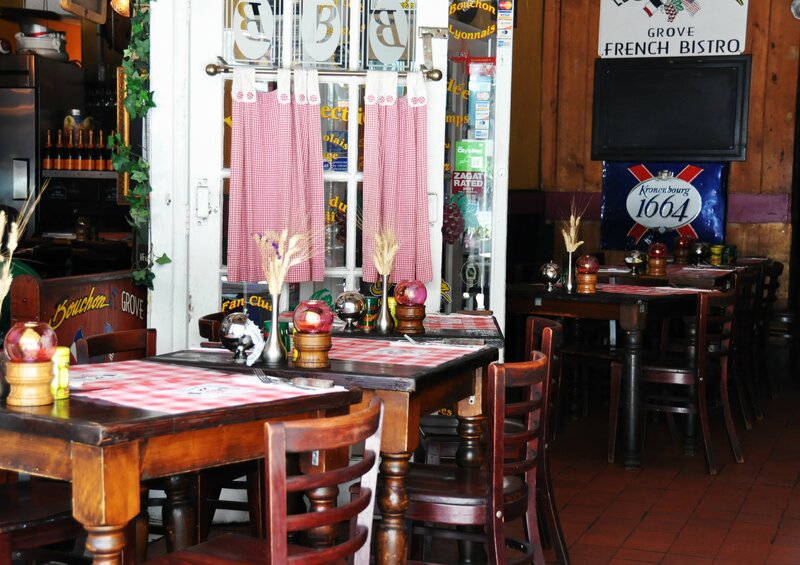 Le Bouchon du Grove is sure to deliver a good meal anytime of the day. Simple, robust and dependable. You can’t go wrong here. After your meal, take a walk. Coconut Grove is the oldest continuously inhabited neighborhood in Miami, very picturesque and full of life.